Over the last 3 years Caravan Guard have been very proud to sponsor wheelchair sprinter Hannah Cockroft and see her develop from a promising youngster to a World Record holding paralympic athlete. Now as Hannah and Team GB get ready to take on the best athletes from around the World at the 2012 Paralympic Games in London we want to wish her one last final good Luck, and are looking forward to watching her fight for the Gold medal she has been working so hard towards. Hannah is racing in the T34 Womens 100m round 1 at 12.15pm on Friday 31st August 2012, the final is then at 8.18pm and the medal ceremony at 8.54pm. 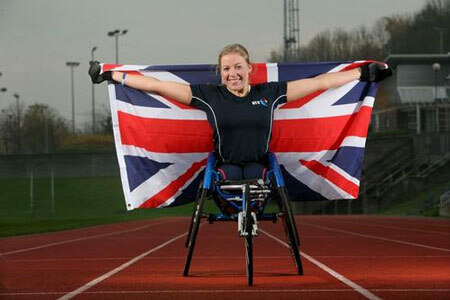 She is also racing in the T34 Womens 200m round 1 at 11.23am on Thursday 6th September 2012, the final is at 7.39pm and the medal ceremony is at 8.48pm. If you want to watch Hannah’s races, Channel 4 have the broadcast rights for the Paralympic Games and are going to have widspread coverage both on TV and online so hopefully the events will be shown live. Check the Channel 4 Paralympics website nearer the time for more info. From everyone at Caravan Guard, go get ’em Hannah!